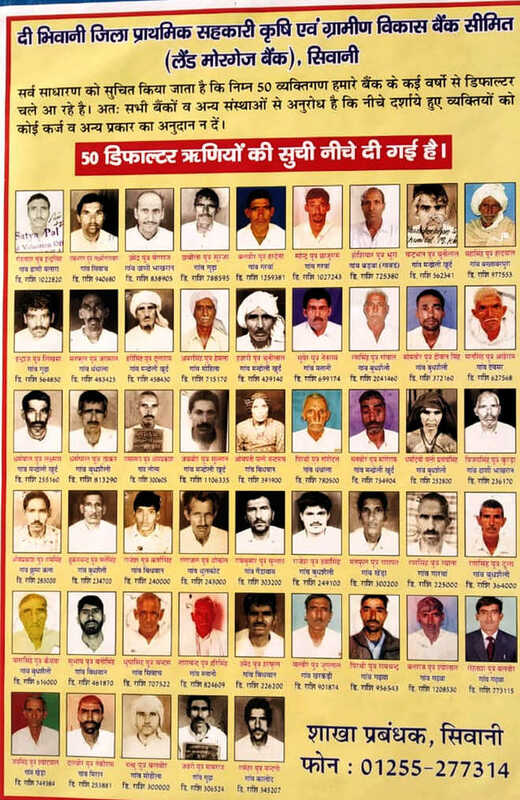 The Land Mortgage Bank displayed posters of 50 farmers in Siwani, Haryana who failed to repay the loans for many years. The bank made an appeal to other banks and financial institutions not to give them any loan or financial grant. In posters, it is mentioned that the defaulters in total owe an amount of about Rs 5 crore. These farmers have defaulted in payment between Rs 2.5-12 lakh. However, Agriculture Minister Om Prakash Dhankar brought up the issue last year, urging banks not to shame defaulting farmers.